All it takes is a little walnut oil and salt, plus a short spell under the broiler, to elevate your squash into something sublime. The exterior gets all caramelized and crispy while the interior is smooth, sweet and creamy. Preheat oven to 425 F. Line a large baking sheet with parchment paper. Peel the butternut squash. Slice off ends. Chop the bulbous part off and scoop out seeds. Slice everything widthwise into just a little under 1 inch thick slices. The bulbous part will be sliced into pretty rings. Drizzle one tablespoon of oil onto the baking sheet and dredge butternut slices in oil. Drizzle the remaining oil over the slices. Spray with a little cooking spray for good measure. Sprinkle with salt and bake for 15 to 20 minutes, then flip, sprinkle with a little salt, and bake another 15 minutes. It should be cooked through and a browned at this point. Turn the heat up to broil. 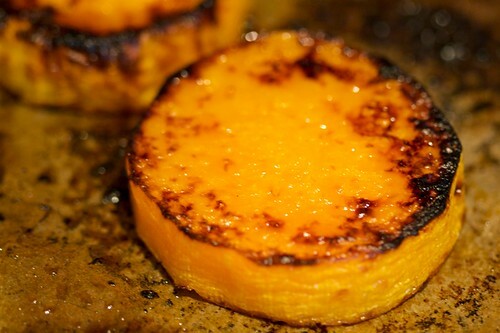 Place baking sheet under broil and cook for about 5 minutes, the squash should be dark brown in places caramelized. The rings may cook faster than the other slices, so remove them sooner if necessary. I love the added excitement of possible death while preparing dinner, so I’ll give this one a shot. woops, that comment was for the beans recipe on homepage, where it talks about the blender, etc… oh well. i did try. Yep, delicata would be great! Yea, the delicata worked like a charm. Just wished I made more. Note to self – use 2 squashes next time! Thanks!! I have two squash on my counter that I have been trying to figure out what on earth to do with. Trying this recipe with them tonight! Looks and smells WONDERFUL. I think I need a better blender, though to grind up those seeds. Or maybe use powdered coriander and cumin next time. Can you use peanut oil instead of walnut? This sounds lovely, but do you have a no-nightshade solution? Something which is a reasonable substitution for the tomato sauce? This recipe motivated me to finally brave my awkwardly placed broiler (the floor grazing type) and boy was it delicious! I removed the parchment paper before broiling, as not doing so seemed risky (see Becky’s comment about possible death lol…I’ll have to check out those beans!). Was I overly cautious? I use unbleached parchment paper from WF. Thank you for this simple, tasty dish in your unending repertoire of never-fail goodness. Yum, yum, yum. I’ll be making this again. Incorporated some maple vinegar I had in the oiling stage. These turned out great. Perfect skin-to-soft texture. See you in Chicago on Friday! Gleichzeitig nimmt der Anteil der Älteren an der Gesamtbevölkerung stetig zu. Dass die moderne Medizin heute in der Lage ist, die Leiden bei schweren Krankheiten zu mindern und somit ebenfalls das Leben um einige Jahre zu verlängern findet sich heute regelmäßig in Zeitungen und Nachrichten wieder. 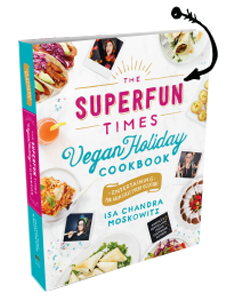 I made this for my contribution to Thanksgiving dinner for my non-vegan extended family last year. I did the baking at my place then the broiling at the event just before eating time. Everyone loved it!! Making tonight! EXCITED! Thinking about adding cumin and cinnamon to bring the warmth out of the butternut squash. We shall see! It is not easy to cook. Cooking’s my favorite pastime during the weekend, and when I feel sad, I always try to cook something new. And when I’ve no inspiration to https://writemyessay.pro/write-my-assignment/, to help with editing, I look for new ideas for a dinner and find motivation to create something brilliant. Thanks for the new recipe.